The greatness of our God is seen in the the things he created to sustain man here on the earth. He made provisions for us and takes care of us as His creatures. Jesus is the Son of God and He is the living Word that gives life. When the people heard that he was in the area as recorded in the gospel reading, they gathered everyone to come and listen to Him and be healed of their infirmities. You have no reason not to draw near to Jesus because He holds the key to your life. He is the one who takes care of us and provides for our needs. He is our healer and defender and in Him is the source of our joy and vitality. Touch Him with your faith always and the transformation you seek will come to you. Today we celebrate the memorial of our Lady of Lords. May our Mother Mary's intercession continue to work for us everyday. Amen. Good morning dearest one. SmileðŸ˜Š as you begin your day and may God bless the work of your hands in this new week. *And May the Almighty God bless you: the Father and the Son and the Holy Spirit. Amen. *Watch-Word:*And God said, let there be light and there was light! 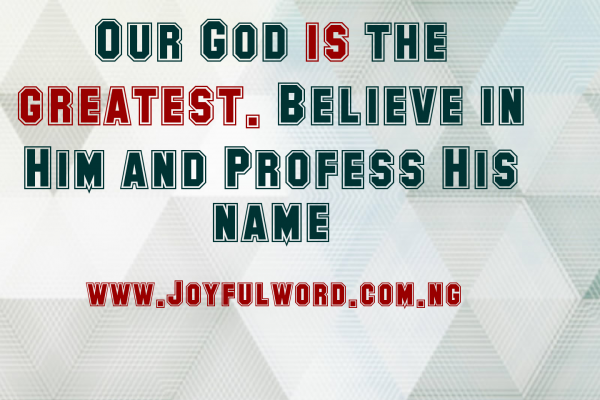 Our God is the greatest, believe in Him and profess His name everywhere you go.